The designer of the Mini broke every rule in the book and helped establish the British Motor Corporation (BMC) as a major producer and exporter of automobiles. 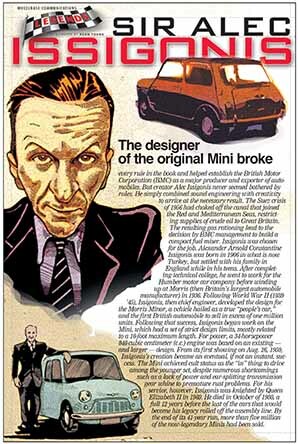 But creator Alec Issigonis never seemed bothered by rules. He simply combined sound engineering with creativity to arrive at the necessary result. The Suez crisis of 1956 had choked off the canal that joined the Red and Mediterranean Seas, restricting supplies of crude oil to Great Britain.